Modern science is attesting to the importance of human movement as an integral part of a healthy lifestyle. Now how about adding some style and integrated movement into your modern life, and testing if it makes you feel more human? Enter Spacial Dynamics. Everything you do, think, or create begins with a change of your space. Space is the hidden catalyst of all movement and change. Spacial Dynamics® studies the fluid relationship between human beings and the space around us. It teaches how to optimize that relationship and break the patterns of old behaviors of movement. Thought, intention, and the human body are interconnected through space. We learn to give this surrounding space direction and dynamic. We then move with enhanced ease, grace, aesthetics, and awareness. Being able to change and adapt are qualities that are vital for any activity. Habits are much easier to create than to change. Habits are formed by repeated movements that are embedded both in the body and in the surrounding spatial gestures/caricatures. Learning to recognize and then change one’s spatial movement patterns is key to being able to change any habit. More than ever before, the future will depend upon our ability to change. Activity can either deplete or invigorate. Spacial Dynamics teaches how to avoid movements that drain and cause strain, in order to move towards greater strength and revitalization. 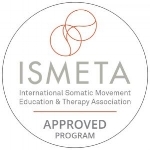 Our program maintains the high standards of an Approved Training Program of the International Somatic Movement Education and Therapy Association ISMETA. Our Level II graduates meet all requirements to become Registered Somatic Movement Educators (RSME) and Therapists (RSMT).